Stagecoach Merseyside has expanded its luxury brand bus fleet in Wirral due to increasing demand. From January 13, Stagecoach Gold buses will now operate on the 38 bus service between West Kirby and Eastham Ferry. Buses will run every 30 minutes Monday to Saturday with hourly services available Evenings and Sundays. The 38 bus service calls at popular destinations including Moreton, Birkenhead, Bromborough Croft Retail Park and New Ferry. All Gold buses feature spacious legroom, comfortable e-leather seats and CCTV as standard. The buses also offer free Wi-Fi allowing passengers to stay connected while on the move. Contactless payment methods are available on board all Gold buses. The highly-sustainable fleet runs off bio diesel and is powered by low emission engines. 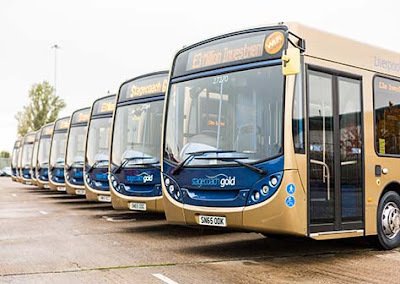 Rob Jones, managing director at Stagecoach Merseyside, Cheshire and South Lancashire, said: “Since launching our first Gold route in 2015, the fleet has proven increasingly popular with passengers who love the added luxury and additional benefits the service offers. “We’re pleased to be adding service number 38 to our existing Gold routes and look forward to rolling out this affordable alternative which will offer passengers enhanced connectivity and comfort during their journey, whether they are commuting to work or seeing friends. Travel across Stagecoach’s bus network in Wirral including on the Gold buses costs £14 for adults and £7 for Under 19's per week.